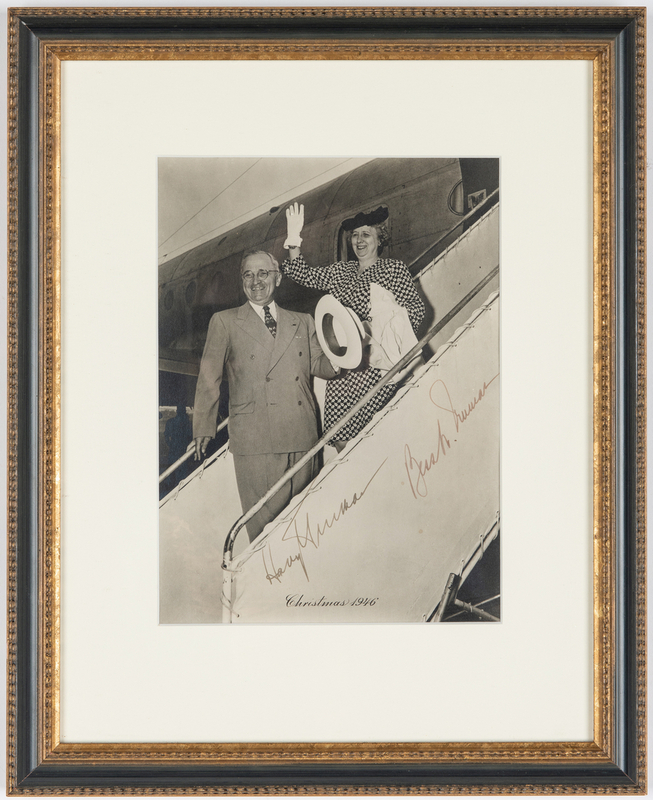 Five (5) Truman administration Christmas gifts, given to his White House presidential staff during his terms in office. 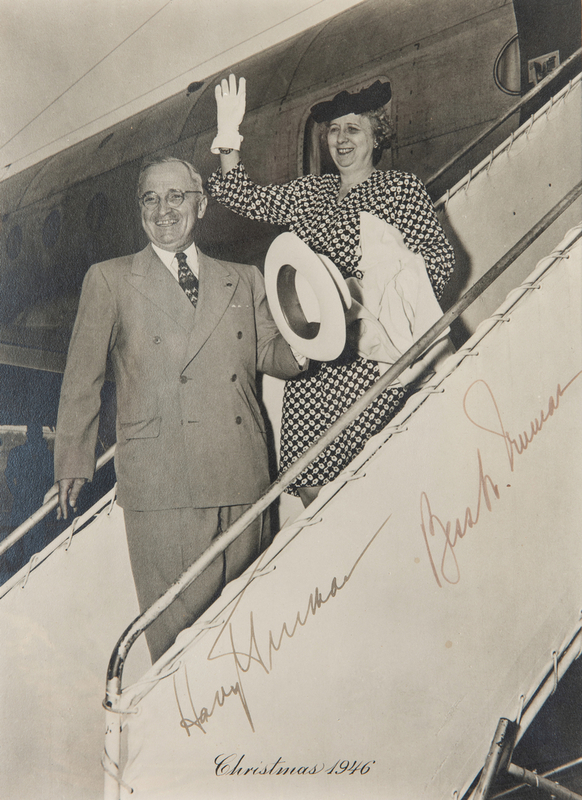 1st item: Truman signed photographic White House Christmas Card depicting the President and the First Lady Bess Truman boarding Air Force One. 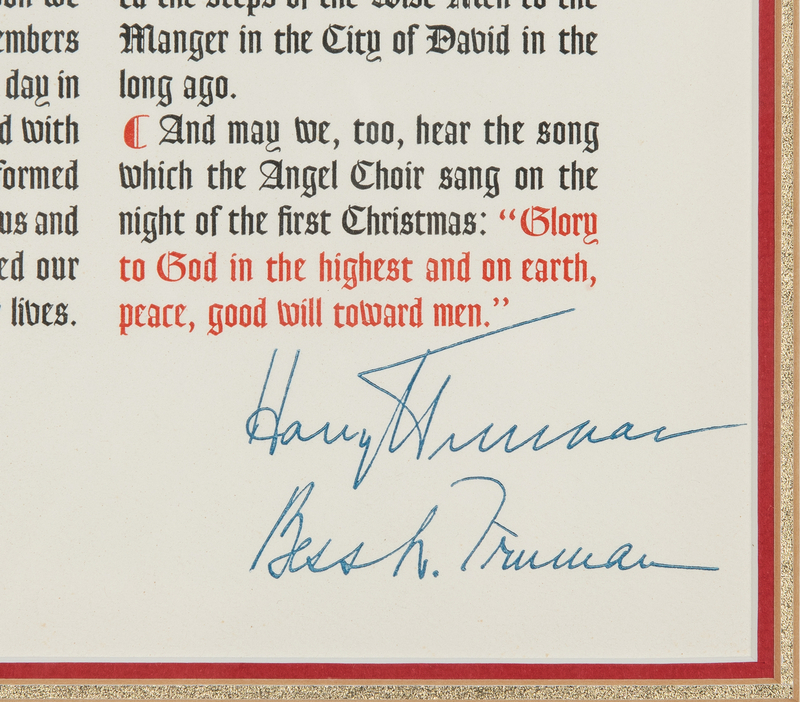 Hand signed by both in ink with black printed lettering reading "Christmas 1946" lower center. 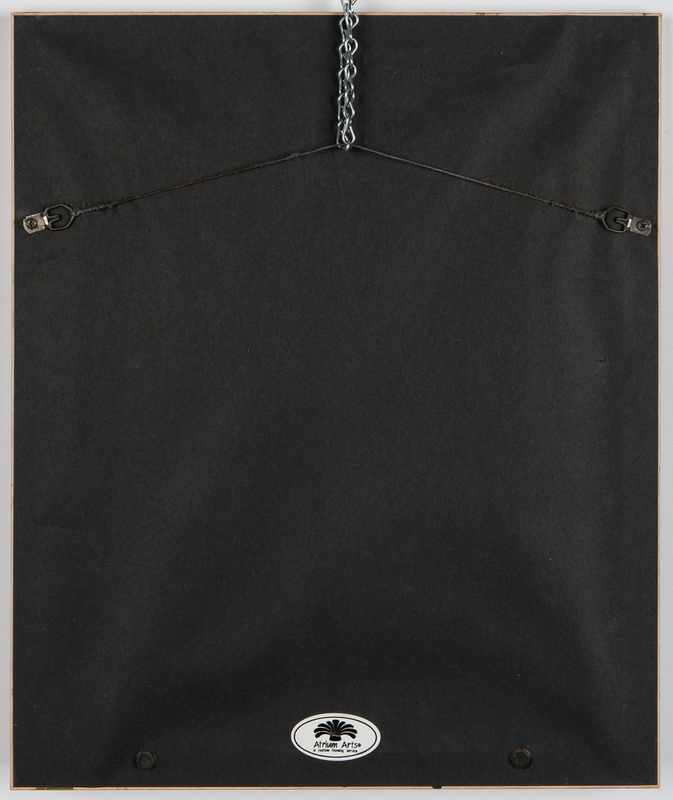 Matted and housed under glass in a gilt wood and black painted frame. 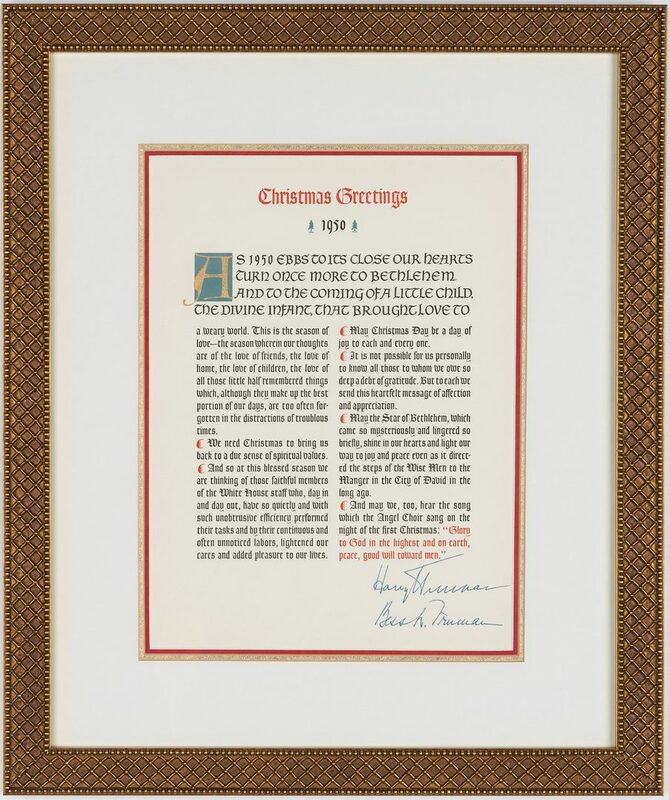 Sight – 9" H x 6 5/8" W. Framed – 15 1/4" H x 12 1/2" W. 2nd item: Black leather Christmas ribbon with gilt lettering reading "'I would rather have peace in the world than be President' Christmas Greetings from The President and Mrs. Truman 1948" below a gilt Presidential seal. Housed under glass in a gilt wood frame with bead course running pattern. 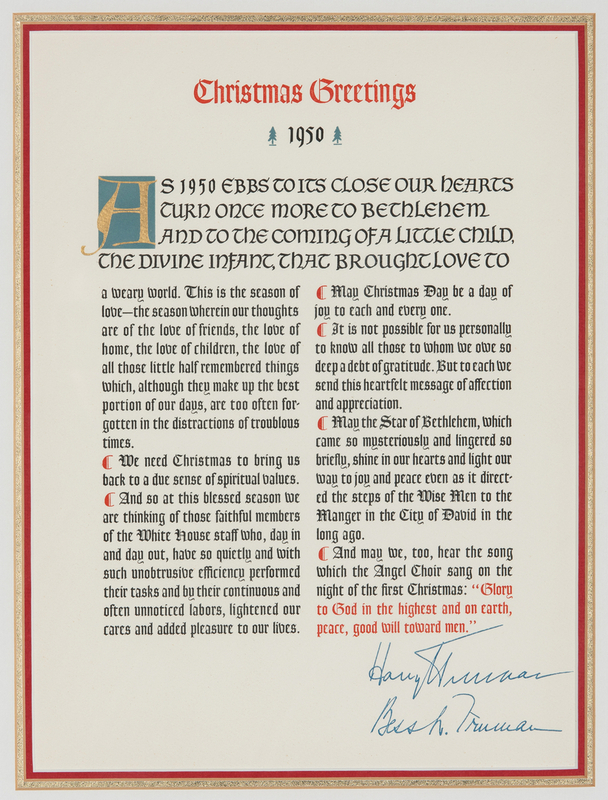 Ribbon – 11" H x 1 7/8" W. Sight – 14 7/8" H x 5 3/8" W. Framed – 17" H x 7 1/2" W. 3rd item: White House Christmas Card with two columns of black and colored printed text reading "Christmas Greetings 1950 As 1950 ebbs to its close our hearts turn once more to Bethlehem and to the coming of a little child, the Divine Infant that brought love to a weary world…" with printed signatures in blue ink from President Truman and the First Lady Bess Truman, lower right under text. Triple matted and housed under glass in a decorative gilt wood frame. 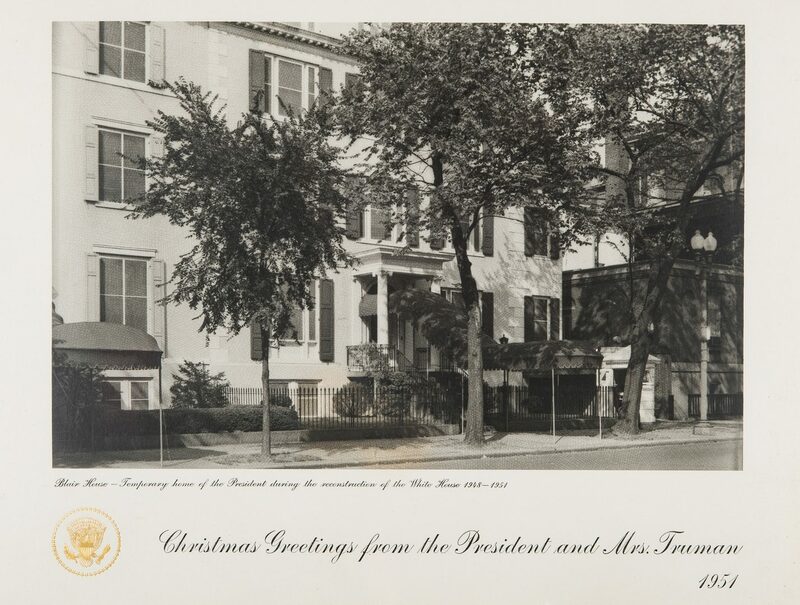 Sight – 11 5/8" H x 8 1/2" W. Framed – 18 1/2" H x 15 5/8" W. 4th item: Photographic White House Christmas Card titled "Blair House–Temporary home of the President during the reconstruction of the White House 1948-1951". 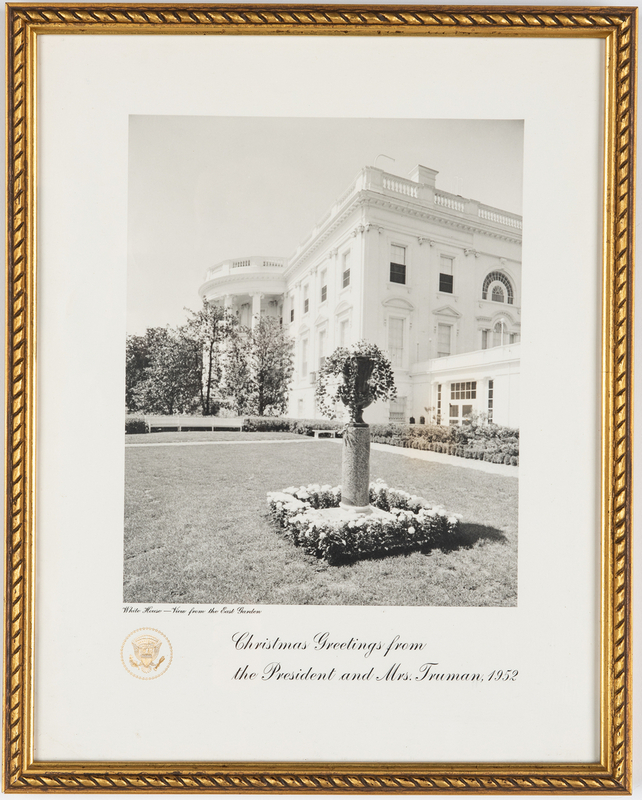 Black printed title lettering, lower left under image, printed black lettering reading "Christmas Greetings from the President and Mrs. Truman, 1951", lower center and right, with gilt Presidential seal, lower left. Housed under glass in a gilt wood frame. 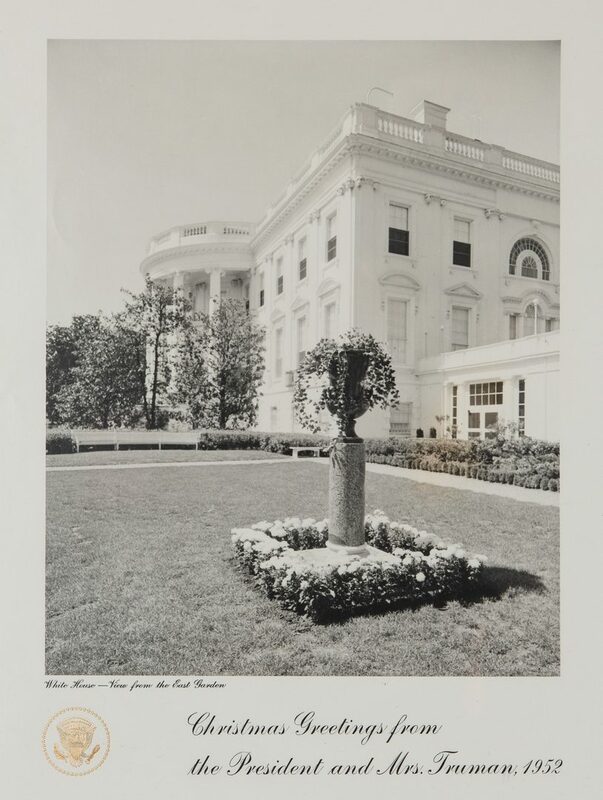 Sight – 10 3/4" H x 13 3/4" W. Framed – 12" H x 15" W. 5th item: Photographic White House Christmas Card titled "White House–View from the East Garden". 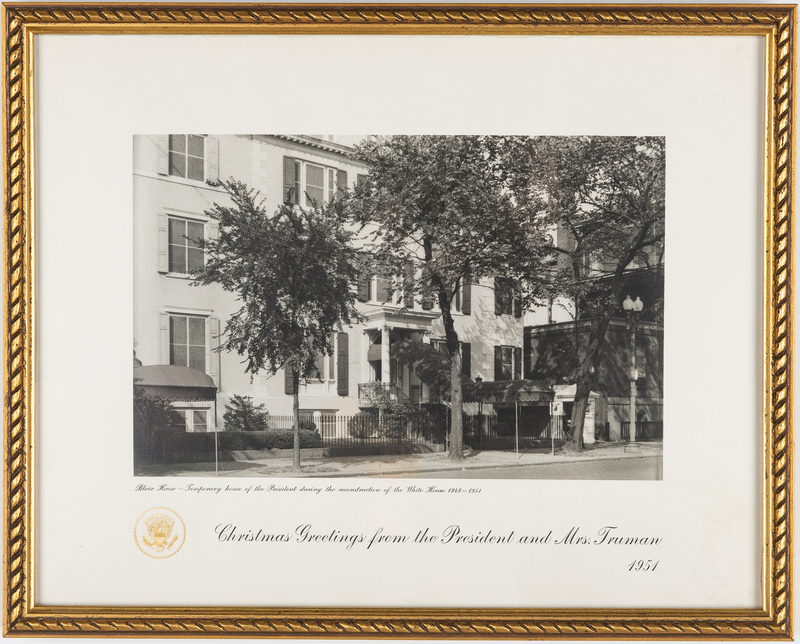 Black printed title lettering, lower left under image, printed black lettering reading "Christmas Greetings from the President and Mrs. Truman, 1952", lower center and right, with gilt Presidential seal, lower left. Housed under glass in a gilt wood frame. Sight – 13 3/4" H x 10 3/4" W. Framed – 15" H x 12" W. All items mid 20th century. Provenance: From the estate of Captain Gordon Wells, member of the Secret Service's Uniformed Division, the White House Police, from 1943 through 1967. 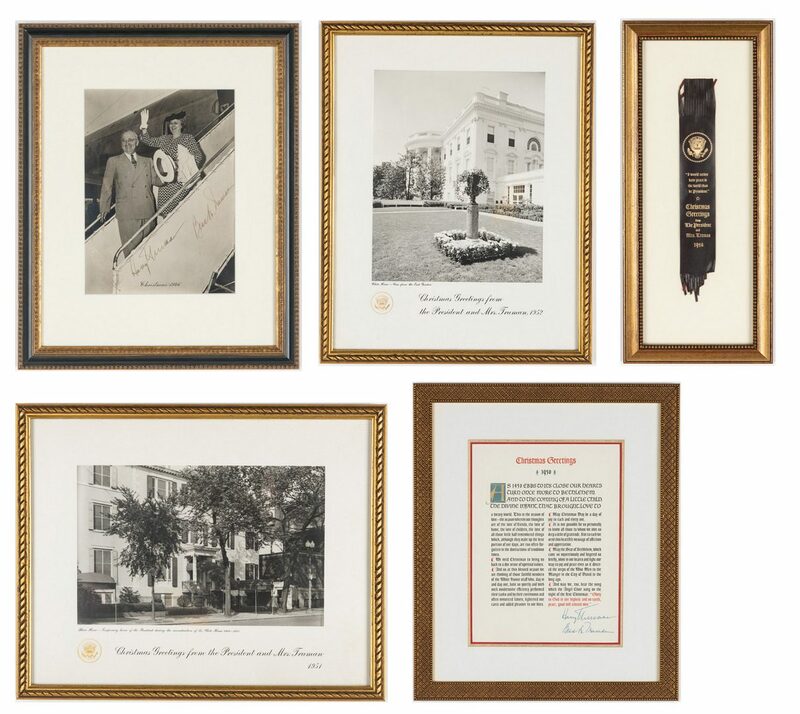 During his tenure, Wells received mementos from sitting Presidents and First ladies of 5 administrations, from Franklin Roosevelt through Lyndon B. Johnson. CONDITION: 1st item: Overall good condition with few dampstaining spots, signatures in strong, clear condition. Not examined outside of frame. 2nd item: Overall good condition with few bottom tassels missing. 3rd item: Overall very good condition. Note examined outside of frame. 4th item: Overall good condition with scuffs. Not examined outside of frame. 5th item: Overall good condition with scuffs, 1 1/4" area of creasing, lower left corner. Not examined outside of frame.